Positano is absolutely incredible! Every single area is an opportunity to take the most amazing pictures- you don’t even have to try very hard to get a great shot. 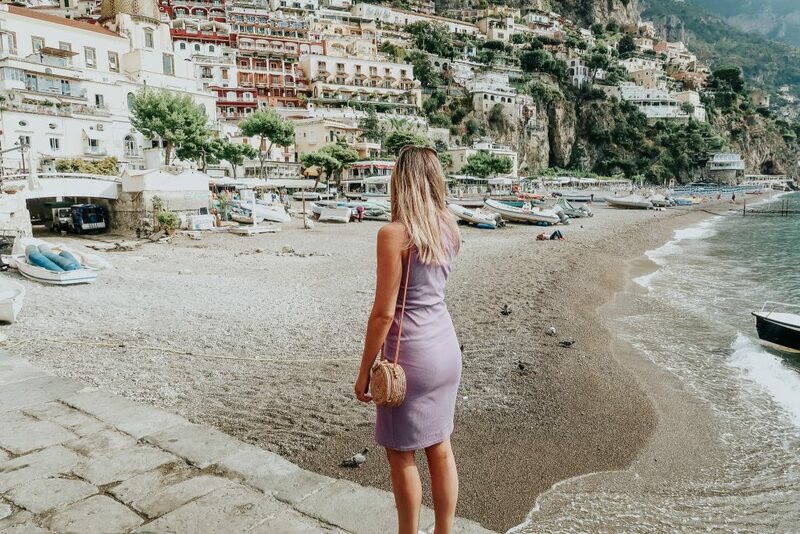 From ocean views to quaint cobble roads, Positano is an Instagram heaven and one that I had the best time exploring. 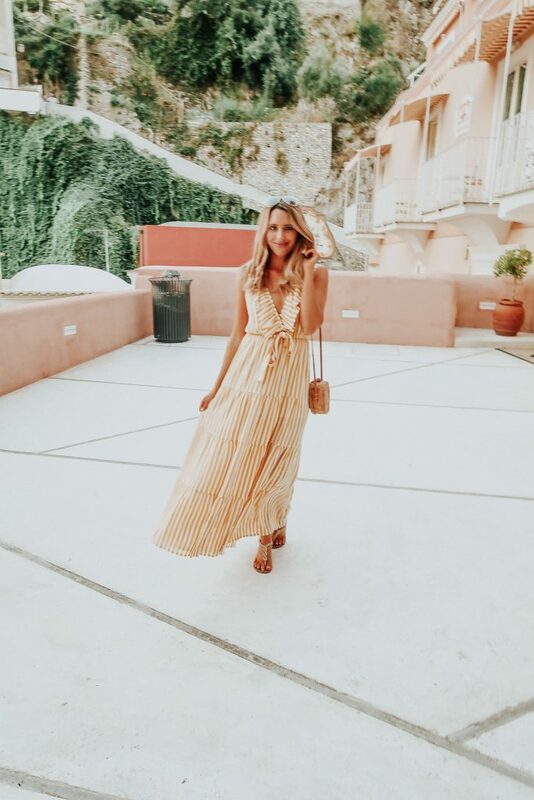 If you want to find out where to take the best shots on your vacay in the gorgeous Amalfi Coast, then keep reading. We were unable to get “the shot” that everyone gets because you actually have to pay 20 Euros to rent a chair in order to get to that area. So what we did instead was take pics from the other side with a different view of Positano. We also ended up getting very similar pictures at another beach which was much quieter and more private – Fornillo Beach. Nestled between the Piazza dei Mulini and Via Cristoforo Columbo, this Deli has to be one of my fav areas for a pic in Positano. It is always buzzing with eager shoppers and sightseers so it can be quite tricky to get the shot. However, if you are happy to forget about everyone watching you and quickly strike a pose, then it is totally worth it! The Marina is the first thing you see if arriving in Positano via a ferry. Personally, I think this is the best way to visit Positano if you are staying else where along the Amalfi Coast. It offers a different view of the village and one that I absolutely loved. It gets very busy in the Marina, so try and make sure you are one of the first people to get off the ferry – this will help when trying to achieve a “no people are around” shot like below, lol! The things we do for the Gram! This is a pretty magical spot in Positano… not only does the Church have so much history but the quad surrounding it is just gorgeous. Although it is always busy, there were often times when we could take a few pics (in the quad) without people around. So hang on for a few minutes and you will be able to get the shot you want. Ah this was my favourite thing about Positano by far! I call this the “secret” beach ( even though there are like 1000 beach chairs so it is definitely not a secret, lol but anyway) – there was literally no one there because everyone was on the main beach. Fornillo Beach is just a short walk over the mountain – the views from here are insane. So if you want an awesome pic with the orange chairs (which you do not have to pay for) head on here. The bars make delicious cocktails, play epic old school tunes and you feel like you are on your own private island! Word of advice- wear sandals on the beach- the beach is made up of pebbles and if you are trying to get that perfect ocean pic, you will experience lots of pain if you are not wearing shoes- tried and tested, lol! This is a must do after the sun has set. Head down to the beach after your sunset cocktails and just before dinner to take some incredible pictures. The lighting is just perfect and the view is to die for. Franco’s Bar is the BEST place to visit for sunset cocktails- my goodness, what a view this place has. It opens at 5pm so make sure to get there slightly early to get a table with the best view ( it is a first come first serve basis). Unfortunately, we arrived late but managed to get an awesome spot just slightly further away from the best view points. I had a glass of Vino and Craig had an Old Fashioned Cocktail. Next time I visit, I will definitely try a cocktail because it seems to be their specialty. 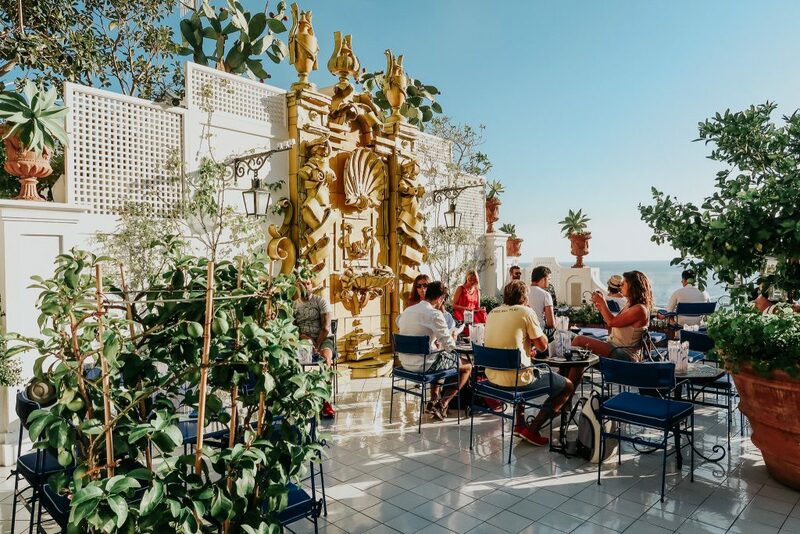 If you can, try pop into Le Sirenuse and take a few pics on their balcony- their view looks right over the Positano church. There is no view like this anywhere else! 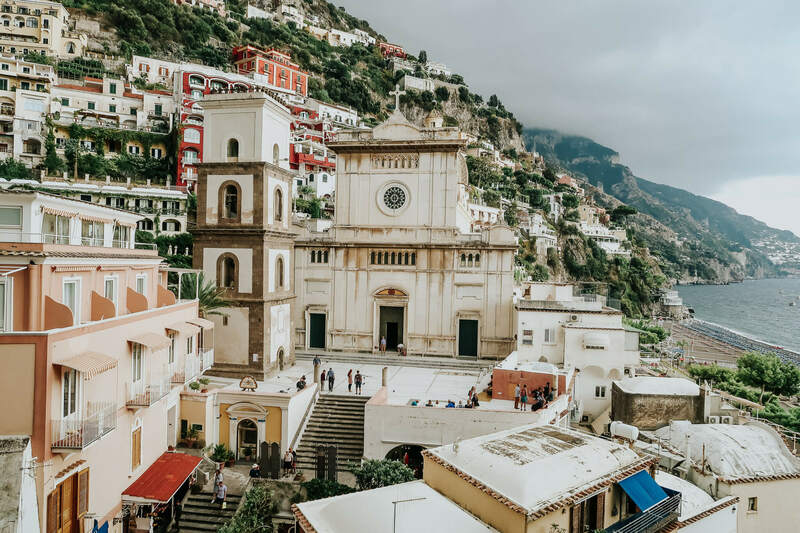 Our trip to Positano was amazing- it is one of the most beautiful places I have ever been to BUT surprisingly, has many incredible similarities to my home town, Cape Town in South Africa. I can’t wait to share more with you about where to stay, eat and what to get up to- so look out for that post. If you are ever in London and looking for a places to do a little Instagram shoot- well I have got your covered. Click HERE to read all about The Top 5 Instagram Hot Spots in Central London. 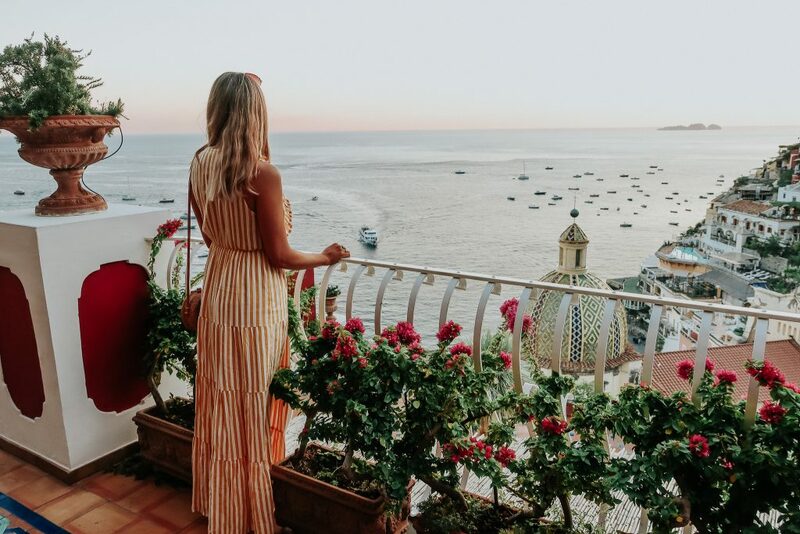 Hope you are all having a beautiful week and if you end up on the Amalfi Coast, have the best time ever- it truly is one of the most romantic places in the world!